Disclaimer: This is a sponsored post. Compensation and giveaway provided by Equal®. Today is National Lemonade Day! It's time to celebrate that refreshing summer beverage that we all love to consume on a warm summer day. 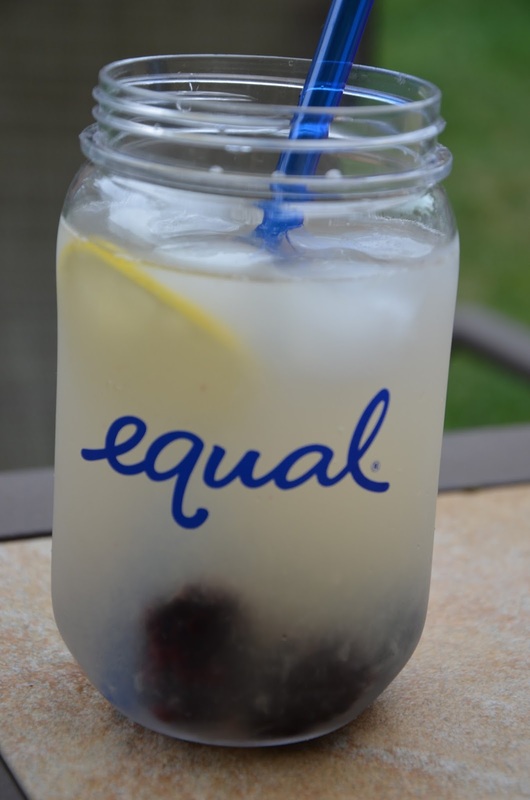 To sweeten up a glass of lemonade without the calories of sugar, Equal® 0-Calorie Sweetener is a perfect alternative. For more than 30 years, Equal® has added sweetness to America’s favorite beverages and recipes in those easily recognizable little blue packets. Besides using it to sweeten beverages like coffee, tea and lemonade, it can be used in any recipe recipes as a substitute for sugar. Having a grandmother who was diabetic and being on the borderline of having gestational diabetes during three pregnancies, I know the importance of limiting sugar intake...and what a bummer it is when you want something sweet, but can't have what's available. Having the option to enjoy something everyone else takes for granted is great and thanks to Equal®, treats can be enjoyed without any worry or guilt. In celebration of National Lemonade Day, Chris Smith, known as the The Diabetic Chef®, has created a Blackberry Sparkling Lemonade that is sure to cool you off on a hot summery day. And...it's one of several recipes in a little booklet that is part of a great giveaway package that one of our readers can win! The giveaway package also includes a supply of equal so that you are stocked up to make some of the recipes on your own along with some other goodies. Here's how you make that tasty lemonade! Stir sparkling water, lemon juice and Equal® until combined. Place 6 blackberries and ice cubes in each of 2 tall glasses. Divide mixture between the glasses and serve. Garnish each glass with init and fresh lemon slices, if desired, and serve. You'll be all set to make your own lemonade and much more. Oh, and a word on that juicer, it is AWESOME! It's perfect to make a quick single serving. Honestly, I'm usually making a quick pitcher full with a mix and after making my own fresh lemon juice for lemonade, there is such a huge difference. I don't think I'll be going back to the mix! Oh, and if you're not a blackberry fan (or have trouble finding them), strawberries, raspberries or blueberries will also add an extra hint of flavor and some lovely color to your fresh lemonade. Anyway, if you would like to enter to win, enter below. Giveaway starts at midnight and runs for one week! Coconut water is especially good in the summertime!